The Kilt is a very old garment that has been around for many years. It is a noble item that came from the early Celtic race of Caledonia. It is argued that the Kilt came from Ireland instead of the Scottish origin. There are two sides to every story and it is up to you on which you decide to stick with. The tartan Kilt has been around for many years in the cultural tradition of Scotland. The features and traditions have been brought in by the Nobles of England and not by Scottish Highlanders. There is a lot of evidence that many of the tartans that are seen to day are made from the inventions of Scottish and English tailors during the reign of Queen Victoria. 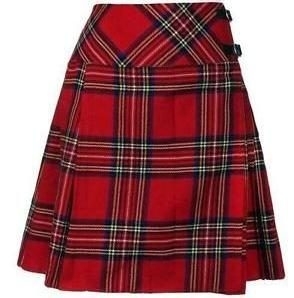 It has been known and accepted that the idea of a tartan and wearing a kilt did get their origin in the history of the early Scottish and Irish people. It has been established that certain people did aspire to a certain uniform of design for their articles of clothing as early as the tenth century. The Kilt is the main way of dress for the Highlanders and is also known as the belted plaid. This plaid is known to be a multicolored design of stripes and checks. These patterns were and are used to identify the family or regiment from where the person wearing the garment is associated. During the eighteen hundreds wearing of the belted plaid was beginning to get turned in for the kilt. The belted plaid was belted at the waist with the rest of the material worn around the shoulder. This was a very uncomfortable style to wear. The new kilt design becomes more popular and more comfortable to wear. It also consisted of plaid that had traditional pleats sewn in place. This separated the bottom half from the top half. This made it easier for the top section to be taken off when it was convenient. When the dress code was repealed in 1783, the fabric of the Celtic had been changed. The dress act made it possible for altering the Highlands to the point that many of the old traditions and customs were gone forever. Wearing the plaid has become a statement and was not longer a necessity for Highlanders. Today there are many styles and new designs of the kilt and are worn for many different reasons. There are some that are traditions and others that are worn because they are a fashion statement. There are so many people that do wear a Kilt for personal or spiritual reasons beyond anything that has even been believed.